As I write this, Steve and I are in Bradford, England. Bradford is a multi-ethnic urban area alive with many ministry opportunities. As you walk to Starbucks in the town square you see many women in full burkas, and you hear many different languages spoken. Our Reach Beyond office here in England hosts the Millside Center where refugees from all over the world find help, healing, and hope. As I’ve been walking the streets here, I’ve been thinking about how often the bruised and broken don’t feel that they have earned the right to have a seat at the table. Their situation reminded me of the story of David in 2 Samuel 9. King David, finally on the throne, asks if there is anyone left in Saul’s family to whom he can show kindness. How amazing, right? Saul was David’s arch enemy in many ways, and yet David asks if there is anyone left that he can treat well. As the story unfolds we discover that there is one family member left, Jonathan’s son Mephibosheth. Jonathan was King Saul’s son and David’s good friend, and Mephibosheth was lame in both feet. Crippled not only physically but by the stigma attached to people who had special needs, Mephibosheth was considered a person of low worth. Yet David invites Mephibosheth to eat at his table. Jesus consistently demonstrated a heart for broken people. He came for the broken, to give them a seat at His Father’s table (Mark 2:17). I don’t know if you’ve noticed, but sometimes we can be a bit judgmental. We wonder, “Why doesn’t that homeless person simply get a job?” Or we cower in fear when a woman peers at us from behind her burka wondering, “Is she a terrorist?” The truth is that woman may have been through tragedies and heartbreaks that you or I have never experienced. Perhaps we view those with special needs as “less than,” yet God places intrinsic value on these people. Jesus loves the broken, the bruised, and the bloodied. He came for the messy and the misfit. If Jesus had a heart for broken people, how can we who claim to be His followers not? 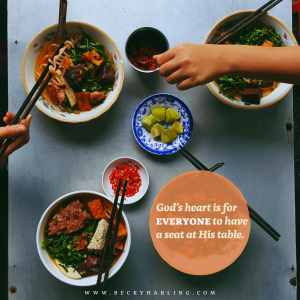 God’s heart is for everyone to have a seat at His table. It’s easy at times to become numb to the suffering in the world. We get wrapped up in life and forget that God’s heart is for all to come to His table and receive His love (2 Peter 3:9). He has commissioned us with sharing the good news of His love with all people (Matthew 28:16-20). It’s good to be reminded that this calling is not for a select few. It’s for all of us who claim to follow Jesus. We all have the responsibility to share God’s good news with all people. If God’s heart is for everyone to have a seat at His table, who are you inviting? God has given you a seat at the table, and in return He asks that you open your heart to others around the table. I never want to lose the wonder that God has given me a seat at His table. He’s taken my shame. He’s clothed me in His righteousness. He’s given me His name. How can I then not open my heart to others and invite them to His table? Friend, this week would you ask God to open your heart to those who still need a seat at the table? Perhaps take a few moments and study the worldwide refugee crisis and consider how God might want to use you. Or explore how you might get involved in prison ministry. There are plenty of broken people, including you. So what if we decided to ask God every day to give us someone to love who was broken? Or what if we asked God to give us the courage to share the love of Jesus with just one person per week? How might we see the guests around the table grow? Lord Jesus, open my heart to see people as you see them. Help me to love like you love and to offer grace like you offer grace. Bring my heart into perfect union with yours so that those around me see and feel your love today! Steve and I will be in Kenya all week! We’ll be speaking at a conference for missionaries on Joy in Ministry from the book of Philippians. We covet your prayers as we’ll speak 7 times. Pray for us as we speak that we will flow in sync with the Holy Spirit. Pray for energy and good health as we travel. Pray for wisdom as we seek to be the leaders God has called us to be.